This Week In Schroon Lake: Circa ? Calling all local historians and amatuer history buffs! Help us put a date to the above poster! Here are the clues: We know these shows were at the Leland Center Theater, we know they ran from July to August, and we know you could buy tickets at the Schroon Lake Chamber of Commerce or at Blasdell's Restaurant. 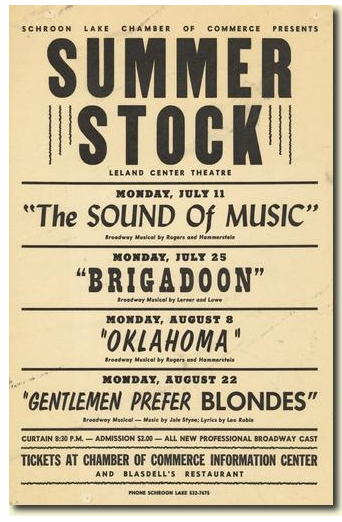 The Leland Hotel -- in its second icarnation -- was open until 1952-- so the date for Summer Stock is before then. Share your ideas on when these shows played here in Schroon in comments.